This article is about the section of U.S. Route 20 in Idaho. For the entire route, see U.S. Route 20. U.S. Route 20 (US-20) is the portion of an east–west U.S. Highway in the state of Idaho. It begins northwest of Parma at the Oregon state line and ends at least 9.6 miles (15.4 km) away from the Yellowstone National Park west entrance at the Montana state line. US 20 crosses into Idaho northwest of Parma, running concurrently with US 26 and joins US 95 through Parma. US 20/US 26 leaves US 95 southeast of Parma and runs to Caldwell where US 20/US 26 joins with I-84 and US 30 for a short time. These four highways parallel each other (on two roadways) to Boise where US 20/US 26 runs through downtown before joining with I-84 and US 30 again to Mountain Home, where it departs at exit 95 to head east, past Rattlesnake Station, Anderson Ranch Dam road, and cresting at Cat Creek summit at 5,527 feet (1,685 m) above mean sea level. It continues into and across Camas County through Fairfield to Timmerman Junction, the intersection in Blaine County with State Highway 75, the route to Sun Valley, Galena Summit, and Stanley. US 20 continues east through Picabo and Carey, joined with US 26 and US 93, to Craters of the Moon and Arco, where US 93 splits off and turns north-northwest to climb the Big Lost River valley. 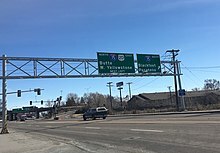 US 20/US 26 continues on through the Idaho National Laboratory, where the highways split just west of Atomic City; US 26 heads to Blackfoot and US 20 to Idaho Falls, where it turns north-northeast to pass near Rexburg as a freeway. US 20 then climbs through the communities of St. Anthony, Ashton, and Island Park, and crosses the Continental Divide at Targhee Pass at 7,072 feet (2,156 m), entering Montana west of West Yellowstone. ^ a b Weingroff, Richard (October 17, 2013). "Ask the Rambler: What Is the Longest Road in the United States?". Federal Highway Administration. Retrieved December 4, 2014. ^ Google (February 29, 2016). "Snake River to Yellowstone National Park" (Map). Google Maps. Google. Retrieved February 29, 2016. ^ "Thornton Interchange opens, U.S. 20 improvements now complete". East Idaho News. November 18, 2016. Retrieved July 16, 2018. ^ "Milepoint Log — State Highway System" (PDF). Idaho Transportation Department. Retrieved April 15, 2016.